First of all, Happy MLK Day! Martin Luther King Jr was one of the most inspiring American men of recent history and I am so thankful for him and his message of love. Have a great day celebrating! I am actually really excited about this post. For whatever reason, it is so much fun to go back and look at the different outfits I wore over the course of the year. I've said it before and I'll say it again - I really don't consider myself to be that into fashion, but posting my outfits on this blog has been so helpful to me. My style has really developed and I have invested in a better wardrobe. I have never felt so comfortable with the clothes in my closet as I have this year. My budget, and my husband, thank me. Last year's Top Outfit Posts of 2012 was a fun post too, but it is really interesting to look back and see how things have changed in the past year. If you're not into outfits, at least enjoy the progression of the alleyway behind me from winter to fall, and watch my hair get longer. It's sure to occupy you for a few seconds. 1. aztec sweater and green jeans This picture makes me sad that I don't have that sweater anymore (it shrunk in the dryer so I gave it to a much smaller friend). I love the combo of the pinstripe shirt and patterned sweater with the bright pants. 2. wearing a military vest at work Ah, the military vest. Every style blogger's best friend. It really is such a great layering piece. 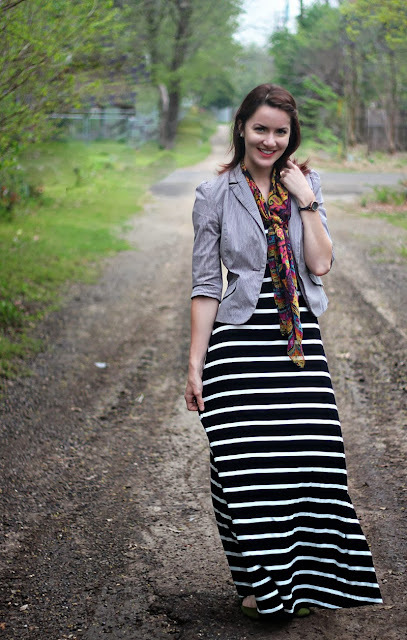 3. hunters and striped dress This might have been my post popular outfit post this year... I don't know if it's the boots or the dress or what, but I do like the way it turned out. Simplicity at its finest. 4. stripes on stripes This outfit was also popular (apparently April was my best-dressed month? ), and it was also a personal favorite. I love maxis and and I love making them work-appropriate. 5. floral pants and gray tee Those pants were probably my favorite purchase of the year. I mean, they're just so... fun. Just look at my face: does that not scream "fun" to you? 6. blue, yellow and green This actually might have been my favorite outfit this year. I have had each item that I am wearing for a long time so it was slightly exciting to put them together in a new way. And this outfit just feels like me. 7. 4th of july festive I've worn this outfit two 4th of July's in a row and I love it so much I'm sure it will make an appearance in 2014. 8. green and white I'm a sucker for green, so this skirt (given to me by a wonderful friend!) has been on constant rotation for the past few years. 9. sweet birthday outfit besides the hilarious pose (look at that hair flip! 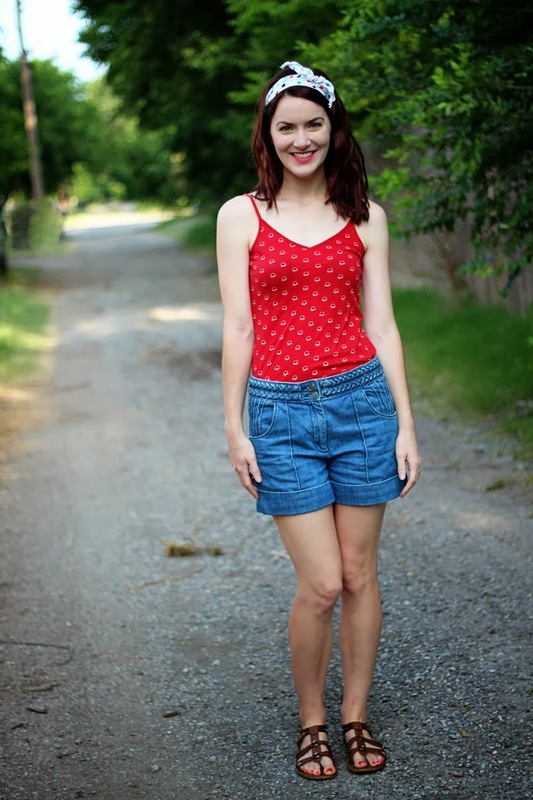 ), I love this outfit for how simple it is. It seems all a pretty skirt needs is a simple chambray. 10. lots of blue I love this outfit. I am so glad I tried the tone-on-tone look with these pants. 11. maxi dress for work This wasn't a reader favorite, but it was one of my favorites for sure. I just love maxis and I love that I finally put these two items together. 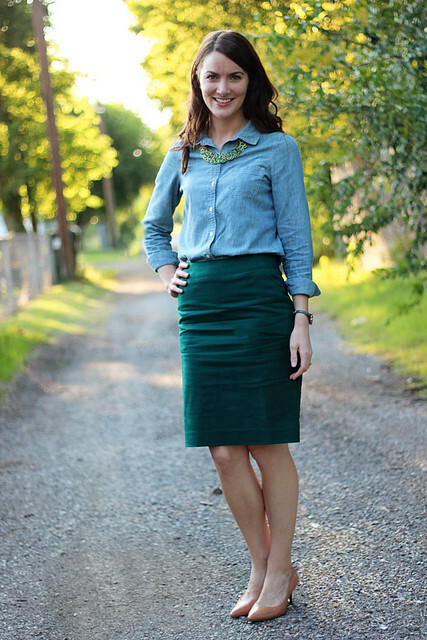 12. green and chambray despite the wrinkly nature of the skirt, I really like the way this turned out. Probably because you know, of that whole "sucker for green" thing. 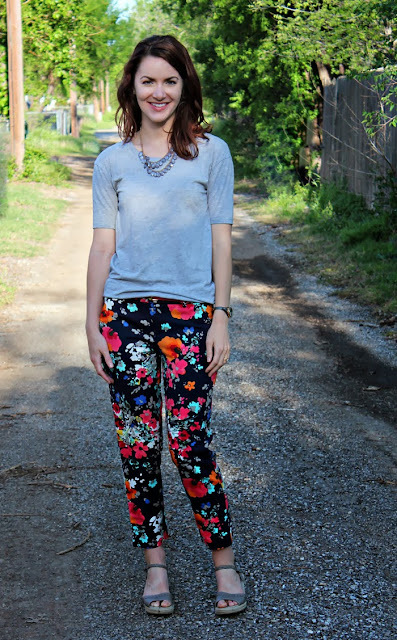 13. floral pants for fall one of my goals in blogging my outfits is to wear things different ways. 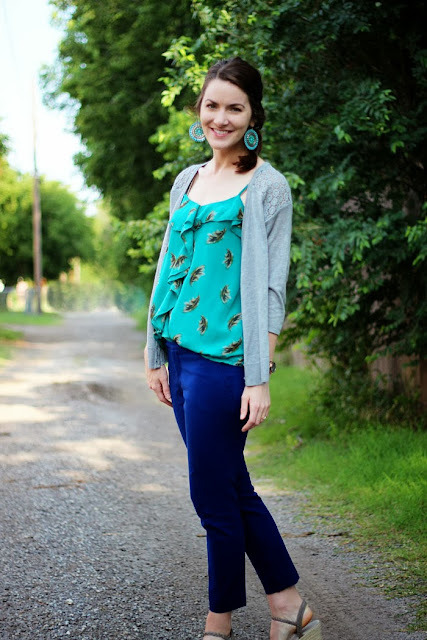 Even though the pants are pretty summer-y, I was glad that I figured out how to wear them for fall. I like color. Honestly, that kind of surprised me. I usually view myself as a gray and black type of person, but it turns out that I feel most confident when wearing color. I think I will try to incorporate more color into my outfits in the future. Stripes and floral take the cake. Those are my patterns, people. I tried to incorporate a few new patterns in there, but those are just my favorite. I prefer skirts to pants. I already knew this one, but seeing it in real life made it more real. I think skirts are more comfortable and more flattering. Win-win. Necklaces can really make an outfit. I am NOT a jewelry person (you'll never see me with a million bangles on my wrist, no matter how cool it is), but most of my favorite outfits featured necklaces. This is the first year that I've really worn necklaces and I am so glad I did. 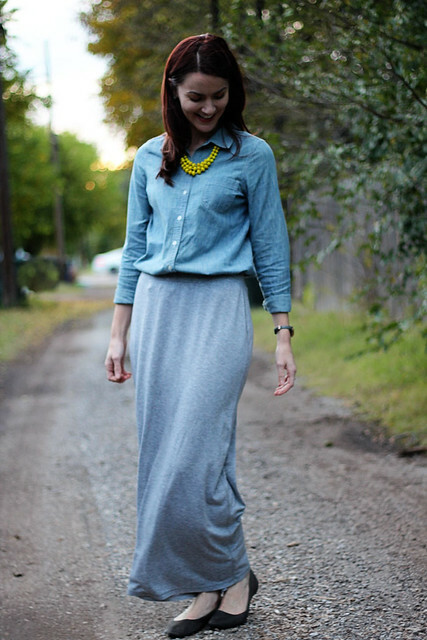 Chambray is the best thing ever. I don't know what I did before chambray existed. I dearly hope that it will never go out of style. Somehow I wore my favorite chambray shirt even more this year than last. Which outfit was your favorite? What did you learn about your own personal style by looking back on what you wore during the year? This was a fun post (I even went back and looked at your best of 2012 post!) You definitely rocked it in all this outfits. Love looking back on all of those! So sad that sweater shrunk. :( That's the reason my dining room table is always covered with clothes from the washer - Tall people just can't risk putting their favorite pieces in the dryer. Blah. But yay for all the cute outfits!! Amazing post!!! Love the outfits, they are darling! Skirts definitely suit you! I've been wanting to get a second maxi dress for like a year, but I haven't been able to find one that I love that isn't wayyy too long! 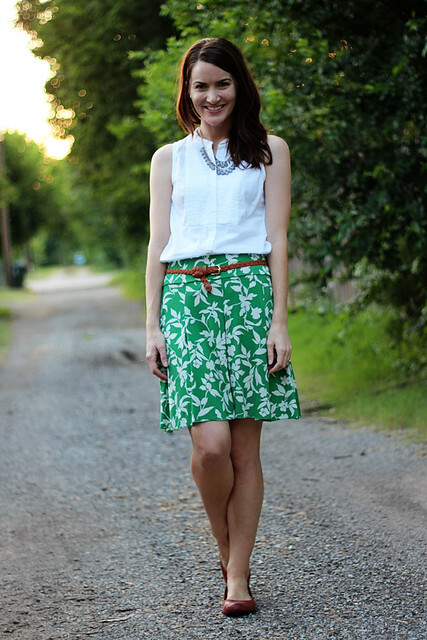 Love every look especially the green skirt outfit. I need more skirts in my life. i love this idea! i hope you don't mind if i steal it as inspiration for a post of my own! I think #6 was my favorite but yellow is my favorite color so it is probably why it really stood out. Though the look feels more my style too. I do love the stripes too. 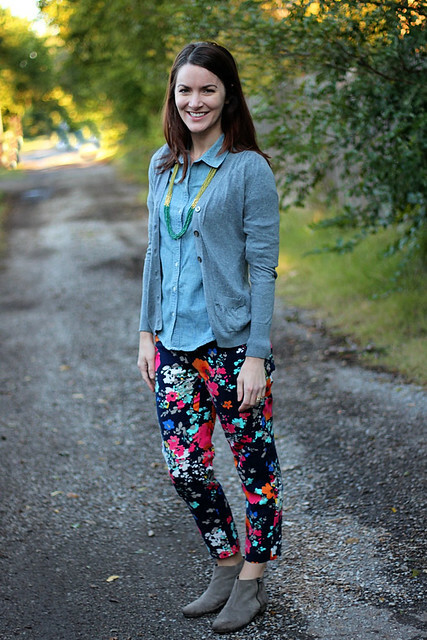 Love every outfit you have featured here Ashley :) the floral pants look super fun! Oh my gosh, I love all these outfits! After seeing your pictures, I'm thinking I definitely want to add some green into my wardrobe. Ashley! Love all the outfits, and love even more your reflection on what you wore and what you learned! And gosh that outfit with the Hunters and the striped dress is beyond perfect!! Can't wait to see what you continue to wear in 2014! Such an awesome idea for a post! 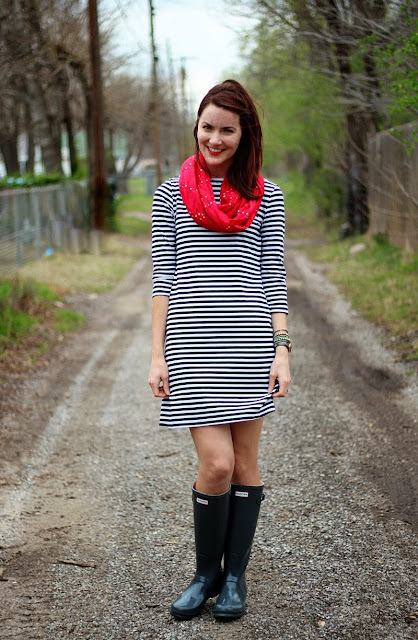 I love how you paired the striped dress with rain boots! I'm going to remember that for spring! I am just finding your blog! Love your style! This is a great recap! Love your best looks for 2013. I agree with you... you do love color! And you style it and wear it very well! New follower so I look forward to seeing future posts! I love all of these outfits! I still have to get myself some more floral and an Aztec print sweater though! You look fabulous girl! oh hi, i think we're style soul sisters judging by your bullet points on the bottom there, haha. i pretty much live by all of them- especially the bit about the chambray. i *live* in mine, it's completely over abused. and i LOVED this post, it was so fun to see all your top outfits. i never really noticed how colorful you are- you just pull it off in this clean, non-loud way, but seeing it all in one spot proves it to be true :) awesome post, and loved that MLK jr quote, so beautiful. 3, 5, and 6 are my top three favorite on you, but they are all fab. LOVED watching the seasons change in your alleyway :D Why mess with a good thing though, it works perfectly as a backdrop! These are all really cute, Ashley! 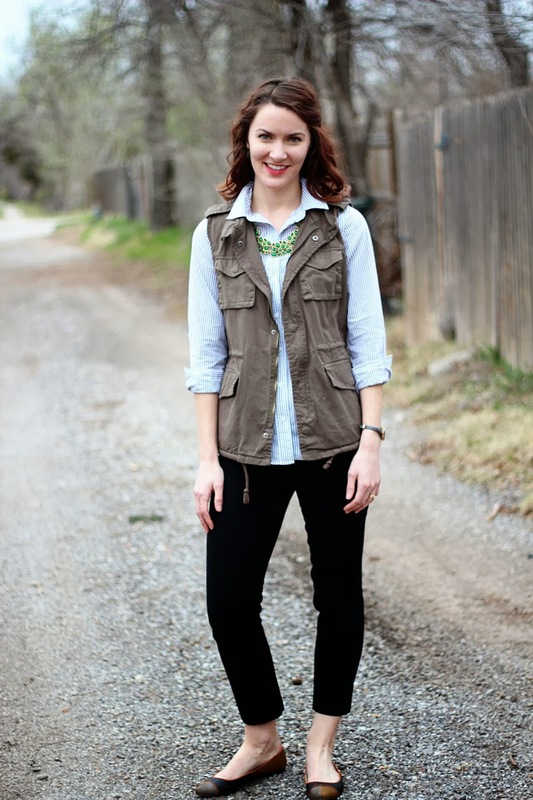 Especially like the outfit with the rain boots and scarf - and I'd love to borrow that vest! 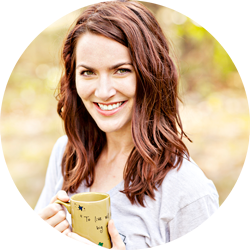 :) I feel like I can relate to how you use the blog to improve and come into your own style. I never imagine it would be as fun as it is. Nor did I imagine the amount of neat bloggers, such as yourself, writing about their lives out there. Thank you for including me in your journey! These outfits are to die for! The striped dress/hunter boot combo is my absolute favorite, what a stylish way to rock rain boots. You had a very stylish 2013, here's to another fabulous 2014! I liked seeing how your photography developed over the course of the year. I think colour looks great on you too, especially when you have it up close by your face (like your outfit with the green top and bright green earrings) -- it really makes your complexion pop! You have such a cute closer! So sad that sweater shrunk. It's cute! SO many fun outfits for the year!! It's hard to choose a favorite because I love green and all things bright and cheery. If I had to pick a favorite, I'd have to say 5 or 6 but 9 is pretty wonderful too! I look forward to seeing more of your outfit combinations especially stripes, florals and GREENS! I'm also intrigued to see what new style trends you'll be incorporating into your wardrobe - metallics, leather, flowly floral, dainty jewelry, radiant orchid, etc. That was indeed an adorable 2013 for you.....love you too in a maxi & in everything else you wore! You have some amazing, gorgeous skirts! 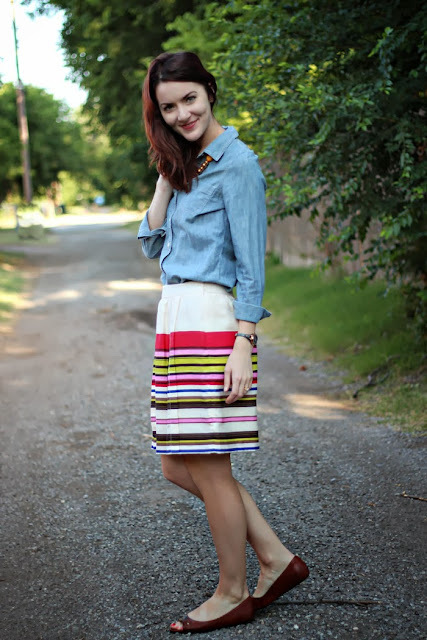 I am loving your yellow skirt with the striped top! I have been MIA for a while Ashley but I always read where I left off. First off I enjoyed your Christmas Recap. I think out of the whole year, these Favorite Outfits Posts are my favorites that bloggers do. And girl you are a great fashionista and a;so a fashion blogger, come on. I will bug you again this year to blog Outfit Pictures at least twice a year. LOL I love Outfits 1-3 and the 2 Outfits featuring the Floral Pants the most. Those are some Great Pants. You have a great collection of Skirts, too, I noticed. And all your Green and Turquoise Necklaces are really pretty and make your Outfits pop. I agree what you said about Chambray Shirts too. Before last Summer I had none and now I have 5 of them. A Great job of Outfits and Purchases in 2013. Here is to a Better, Brighter, More Stylish 2014!! I"m pretty much obsessed with all these outfits! I LOVE the green pants! I've been trying to find a really good pair of colored pants, but I just haven't had much luck yet. Such a fun post. Really gives a new reader like me a great snapshot of your style. Also interesting to note that certain items came back in multiple outfits, a great indication you chose your wardrobe pieces well! your outits are so cute!